An 11th-grade student, Đinh Trần Vũ An of Hòa Khánh hamlet in Đồng Tháp Province, has always longed to contribute to the life of the people in his hometown. When he saw that the wastewater discharged from households in his township had terrible effects on the environment and the life of the residents, he invented a clever treatment device that is capable of filtering pollutants from wastewater sources while creating a new source of water for the community. At a low cost of 100,000 VND (US$5.90), the device is affordable for farmers and is relatively easy to install. Đinh Trần Vũ An’s invention during this critical time is helping people cope with the effects of global warming. 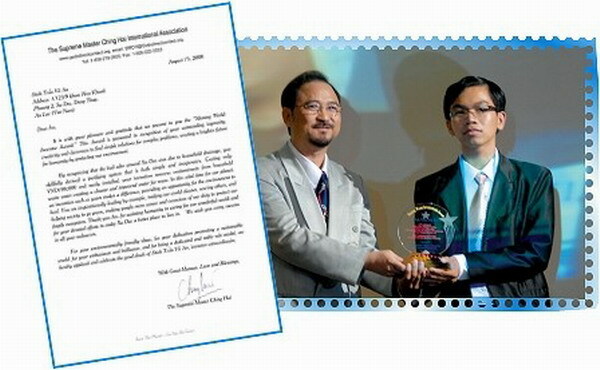 On October 11, Golden Year 5 (2008), Đinh Trần Vũ An was presented with the Shining World Inventor Award by The Supreme Master Ching Hai International Association. The Award was given out during the release of the Supreme Master Ching Hai’s book The Birds in My Life, Aulacese version, held at The Asian Institute of Technology (AIT) in Bangkok, Thailand. In Her letter of appreciation, Supreme Master Ching Hai described An as “a shining example of inspiration that helps create a cleaner world to serve people better, to help society go green, and to help people realize and be more aware of their responsibility in protecting our eco-systems that are being destroyed.” Đinh Trần Vũ An was very touched upon receiving his Award, and was able to meet Master through the videoconference. Master commended him for being so gifted at a young age. The conference has helped Đinh Trần Vũ An to realize there is another path in life, one that is noble, compassionate and loving; a path that will help build a beautiful Earth. Thank you, An, for your environmentally beneficial invention. Our best wishes to you in the days to come as you continue making contributions to better the life of all on our planet.